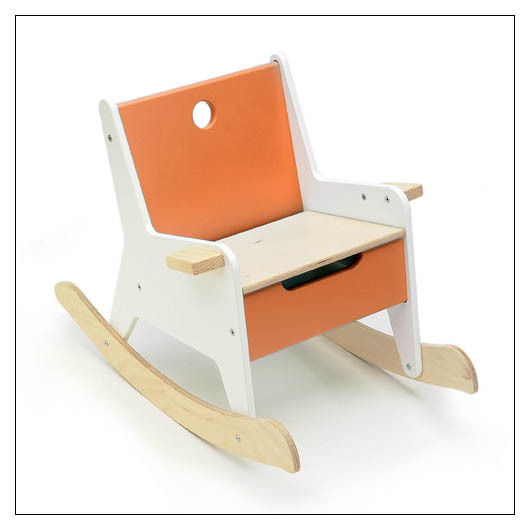 Rockabye Storage Rocker (CKT3) at Pure Design Kids / Toys / Rockers ::: Kids' Toys, Furniture and More at Pure Design Kids! Rocking chair with lift-up seat and plenty of room for storage and treasures. A hole in the back makes handling easy for youngsters. Recommended for children 3 and up, and should be assembled by an adult. Baltic Birch Plywood and non-toxic painted MDF.